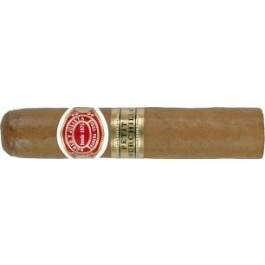 The Romeo y Julieta Petit Churchills is a delicious Petit Robusto, 4" (102mm) long, of 50 ring gauge, and comes in aluminum tubes in a 15 cigars box. Great success since it was released in 2004, all the major brands released such a vitola, with their own typical aromas but with the same characteristics. The Petit Churchills is Romeo y Julieta response to Cohiba, Montecristo, Partagas and Trinidad. Like all Petit Robustos, it is a short and robust cigar, which is quick to smoke but doesn’t compromise on the coolness and the comfort of a larger ring gauge. It has both and it keeps the typical Romeo y Julietta Churchills flavors.